There’s something in the water because I’ve run into several instances in the last week where people have become new managers. I’ve managed folks in many different capacities over the years including soccer teams/ organizations to consulting project teams and to direct management like today. There’s an art and science to management of people, and as I think back to those who have managed me (or do still), the key ingredients include authenticity, trust, and goals/ challenges. Leading and managing a team can be difficult, and it doesn’t make sense that just because you’re good at something, you should be leading others. How well you lead them also goes beyond how you impact them directly. Effective leadership is best assessed by the downstream effects of those your team member end up leading. Management is surely one of the hardest and noblest tasks you can do. Be prepared. In late October at the Sales Force Productivity Conference, I kept hearing whispers about a great speaker that I didn’t get a chance to hear – Lindsay McGregor. She talked about culture and what motivated employees. She also co-authored a book about high performing teams. This has always been interesting to me, so I sought out Lindsay to talk to her about her talk. I ended up running into her several times. When I told her all her books at the conference were sold out, she happily told me to send her an email, and she’d send a signed copy. Well, I got the book in November – Primed to Perform – that she cowrote with Neel Doshi. After reading the book, it’s one of my favorites! I finished it a while ago, but I wanted the material to sit a little while longer before writing a review of it. Yes, it was that good. 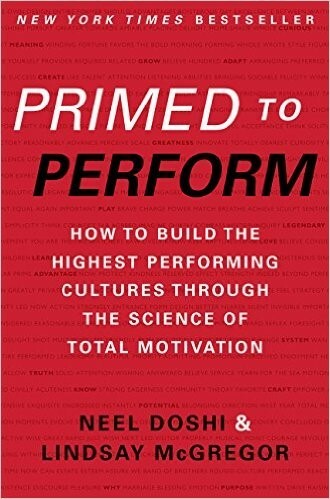 McGregor and Doshi studied hundreds of companies and other studies about high-performing companies to find the key factors of what drove their successes – developing the Total Motivation Factor (“TOMO”). TOMO is made up for 3 direct motivators and 3 indirect. They range from the most powerful motivator to the least influential, and then least influential to the most powerful “de-motivator” – Play, Purpose, Potential, Emotional, Economic, and Inertia. Direct motives – “Play” is the game and the enjoyment attained by the role/ job. “Purpose” relates to the outcome of the activity – the impact. “Potential” is how the activity enables some downstream effect aligning with some personal goals. Indirect motives – “Emotional” pressure occurs through disappointments, guilts, and shame. “Economic” pressure comes from solely having some reward or even avoiding some punishment. “Inertia”, then, is the most powerful indirect motivator. Inertia is the motive where they do what they do simply because they it’s the norm – “It’s a job”. 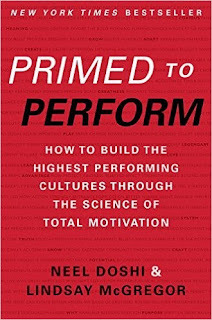 TOMO can be calculated for teams by assessing scores in each of the motives – sample assessments can be found at www.primedtoperform.com. The highest performing companies tend to have TOMO scores at least 15 points higher than their industry peers. Tactical and adaptive performance are critical strategies for every company. Tactical refers to the structure and processes of how a business operates. In sales, this may include following sales cadences for outreach. For marketing, this may include the editorial calendar for social media postings. It’s the plan. Adaptive performance refers to the ability to adjust to changes quickly, and perform at a high level. The military refers to adaptive capabilities as VUCA – variability, uncertainty, complexity, ambiguity. VUCA enables military personnel to adapt to fast-changing scenarios where plans go awry. Beware of cobra farms. When India was a British colony, there was a bounty placed on dead cobras. At the time, cobras were plentiful and roaming wild. With compensation for dead cobras, suddenly, cobra farms started manifesting. This created the wrong solution as there were many times more live cobras being bred. Beware of the incentives and rewards put in place, and how success is measured. There are many more take-aways from the book. In fact, this is one book I will read at least a few times a year to continually remind myself as my company grows and I build my teams. The company will continue to evolve, and enabling a culture that is agile and adaptive will be key to growth and having a sustainable competitive advantage. In sales, you don’t always get the inbound lead who tells you exactly what their problem is. Even more uncommon is when your prospect just tells you how your solution can solve for said problem. Especially when prospecting, it matters to help a lead think about a problem you solve. In this way, menu options are a great way to do this. Menu options are the value levers or benefits your product/ service can enable for prospects. A menu can uncover what a prospect truly cares about while tying directly to your product or service. Think, first, of three menu options. Tie each with a story/ path so you can demonstrate how your product or service meets each option. For early-stage companies with few customers, hypothesize what those value levers are. Otherwise, pull from existing customers what value they get from your product or service. Then align a prospect with the persona of an existing customer, and offer a similar menu option set. Atlanta is notorious for stress-inducing traffic, and it’s going to be even worse since one of the busiest roads collapsed on March 30th due to a fire. Collapses (read: “failures”) have their way of teaching us. So, I want to take a moment to share a few reactions from this debacle. This new challenge will motivate many daily commuters to try travel alternatives. The key here is how this will affect the day-to-day. By integrating public transportation into the daily lives of so many for an extended period, commuters can more accurately reflect on how public transportation can affect their lives. Too often, in the past, public transportation services like MARTA have discounted transportation for special events. Commuters for special events, then, rarely consider MARTA for anything but special events. They certainly would not associate the ease of daily commuting when their limited experience includes jam-packed trains. Forcing the day-to-day can be a real eye-opener for many. Mark McDonough, commissioner of the Georgia State Patrol’s Department of Public Safety came out asking commuters to be patient citing repairs could take months. One of the best parts about his address was cutting to the chase – “… get up earlier. Find a new route. This is new normal.” There is no value in whining and crying about what happened. It’s happened. Adapt. There was a joke going around that this was actually the second major Atlanta collapse this year – the Atlanta Falcons’ major Super Bowl crash being the first. Atlanta entrepreneur Jon Birdsong shared this post – “Why Atlanta’s Collapse(s) Are Good For Us”. In this post, he reflected on how the Falcons’ collapse made him reframe resiliency by studying the orchestrator of the greatest Super Bowl comeback ever – Tom Brady. Birdsong read books and articles about Tom Brady, and adapted much of his own lifestyle to be more like Tom’s. Everything from daily habits like diet and exercise have changed Jon for the greater. Birdsong credits the Falcons’ loss as the motivator. Had the Falcons won, Birdsong would have been ecstatic and hugely supportive. However, the loss has given him a new way to look at life beyond the game. Life happens. Sh!t happens. Adapt, and keep going. This is the new normal. Continuing from last week’s 7 Tips for Customer Case Studies, here are some questions to think about asking (and answering). What does [Customer Name] do? What was the challenge(s) you were trying to solve with [Product/ Service]? Why didn’t existing solutions work for you? When you first used [Product/ Service], what was that initial impression? What are the results [Product/ Service] has been able to deliver for you? Your team? Was there another benefit [Product/ Service] enabled that you weren’t expecting? The goal of the case study is to, obviously, highlight your product or service. You also want to highlight the success and significance of the customer. This adds credibility to the customer, which gives you credibility. Sell, sell, sell. That’s what you’re going to do, and that’s what you’ll aim to do. But, your prospect will need more assurances. They need to know they’re not the only buyer. They need proof. Enter testimonials and case studies. Testimonials mitigate risk with social and professional proof – who they are, why they chose you, and what were benefits have they achieved. Who is the case study coming from? Who is the buyer (person) and company? You want this person to be reflective of your target persona(s). 90% about the customer’s experience and how you enabled them. Pain-Solution. Tie everything to the pain and what the benefit(s) was. Note: think about primary and tertiary pains and solutions. Hit home with the primary, and layer any tertiary. Numbers are worth a thousand dollars. Like a resume, quantifying the benefits is key. If you can’t find one, try again… early on, maybe that’s a SWAG. How do you share? Distribution channels? Are you recording video? Are you just looking for a quick quote to share on a website or marketing collateral? Are you creating a one-pager? This is your learning experience, too. If your product/ service has truly helped the customer, you’ll hear anecdotes. Be acutely aware of details – they matter. Sometimes, you must ask for it. People are busy, but they want you to succeed. Have fun with customer testimonials and case studies. Make them conversational. I recently recalled one of my most vulnerable experiences. (You can find a cut at the story here, too.) In this case, it was how I was cut from the varsity soccer team both my junior and senior years. I shared the story to illustrate the lessons I’ve learned through soccer. You’re only as good as your last game. This is actually not true, but it sets up for some great motivation for your next game. You will make mistakes during games. However, the game keeps going. You need to, too. You and everyone else will be caught up in the game. Realize that what happens on the field can affect what happens off it. Realize when mistakes and emotions occur. Realize there’s a season full of games. Realize there are years of seasons. Collateral damages. I have a “shopping list” of people who I’d like to work with. I’ve worked with many in the past. As I build out my team now and consider future endeavors, I think about this list. Further, that list contains persons who are part of teams of people I know. When I consider the people I want to work with, I think about the opportunities available for each individual. This, however, can fly in the face of the others on the team – the potential for collateral damage amongst individual relationships. Being impulsive. Yes, I can be impulsive. Couple this with my love for language and phrases, and I have a recipe to say the wrong things too quickly. I appreciate the way authors express thoughts or how orators influence crowds. My excitement, then, can cause me to use phrases that may not actually echo what I mean. In today’s world with rapid, instant messaging, this can be dangerous. It’s funny as I think about soccer. Truly great, experienced players are thoughtful, calm, and patient. Read: not impulsive. Recent mistakes have illustrated little in the way of experience. Especially under duress, I realize the need to reach deep for patience and thoughtfulness. However, business is not like a game. Sometimes, you don’t get to keep playing. Sometimes, things don’t just stay on the field.